The United States today is stronger at home and more respected in the world, Hillary Clinton has said in her last foreign policy speech as the secretary of state. She said the country's military and economic strength will remain the foundation for its global leadership. "In short, America today is stronger at home and more respected in the world. And our global leadership is on firmer footing than many predicted," Clinton said in her speech at the Council on Foreign Relations, a Washington-based think tank on Thursday. Friday is the last day for Clinton as the secretary of state. Clinton said the old postwar architecture is crumbling under the weight of new threats. "So the geometry of global power has become more distributed and diffuse as the challenges we face have become more complex and cross-cutting," she said. She said a lot has changed in the last four years. "Under President Obama's leadership, we've ended the war in Iraq, begun a transition in Afghanistan and brought Osama bin Laden to justice. "We have also revitalised American diplomacy and strengthened our alliances. And while our economic recovery is not yet complete, we are heading in the right direction," she said. Clinton called for the nation's institutions and relationships to be modernised, saying what was needed was "a new architecture for this new world. More Frank Gehry than formal Greek." "Think of it. Now, some of his work at first might appear haphazard, but in fact it's highly intentional and sophisticated. Where once a few strong columns could hold up the weight of the world, today we need a dynamic mix of materials and structures," Clinton said. "Now of course, American military and economic strength will remain the foundation of our global leadership. As we saw from the intervention to stop a massacre in Libya to the raid that brought bin Laden to justice, there will always be times when it is necessary and just to use force. America's ability to project power all over the globe remains essential," she added. In addition to building ties with countries, she argued it is also essential to build relationship with people. "You can't build a set of durable partnerships in the 21st century with governments alone. The opinions of people now matter as to how their governments work with us, whether it's democratic or authoritarian. "So in virtually every country I have visited, I've held town halls and reached out directly to citizens, civil society organisations, women's groups, business communities and so many others. They have valuable insights and contributions to make, and increasingly they are driving economic and political change, especially in democracies," she added. "You can't be a 21st-century leader without 21st-century tools, not when people organise pro-democracy protests with Twitter and while terrorists spread their hateful ideology online. That's why I have championed what we call 21st-century statecraft. 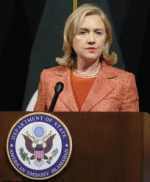 We've launched an interagency Centre for Strategic Counterterrorism Communications at State," Clinton said. The United State, she said, has an interest in strengthening them and building more capable partners that can tackle their own security problems at home and in their neighbourhoods. And economics will always play a role in that. "Next, think about energy and climate change. Managing the world's energy supplies in a way that minimises conflict and supports economic growth while protecting the future of our planet is one of the greatest challenges of our time. So we are using both high-level international diplomacy and grass-roots partnerships to curb carbon emissions and other causes of climate change," she said. Lauding India's "Look East" policy, Clinton has said that America supports New Delhi's move to weave it into the fabric of Asia Pacific region. "We've encouraged India's 'Look East' policy as a way to weave another big democracy into the fabric of the Asia- Pacific," she said. This was the only place in Clinton's speech that mentioned India as she described America's expanding engagement in the Asia Pacific region. "Now, much attention has been focused on our military moves in the region. And certainly, adapting our forces posture is a key element of our comprehensive strategy. But so is strengthening our alliances through new economic and security arrangements," she said. "We responded to the triple disaster in Japan through our government, through our businesses, through our not-for-profits, and reminded the entire region of the irreplaceable role America plays. First and foremost, this so-called pivot has been about creative diplomacy, like signing a little-noted treaty of amity and cooperation with ASEAN that opened the door to permanent representation and ultimately elevated a forum for engaging on high-stakes issues like the South China Sea," she said. Referring to the agenda of the next four years and beyond, she said the US would have to keep pushing forward on this agenda: consolidate its engagement in the Asia-Pacific without taking eyes off the Middle East and North Africa. She also called for keep working to curb the spread of deadly weapons, especially in Iran and North Korea; effectively manage the end of combat mission in Afghanistan without losing focus on the Al Qaeda and its affiliates and pursuing a far-ranging economic agenda that sweeps from Asia to Latin America to Europe; and keep looking for the next Burmas.